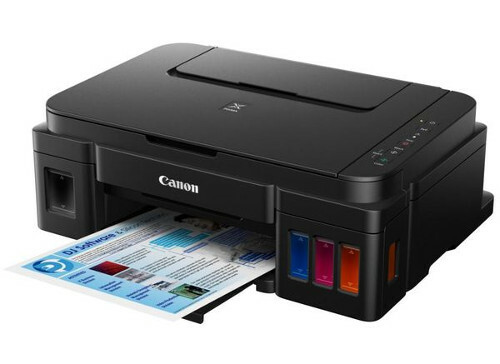 Canon Pixma G3500 Driver Download. The tank for the black ink is attached to the left side and larger than the tanks for the three basic colors. Canon uses a pigment black in all devices, which is not likely to be smudge-proof. This can be expected with black contours and proper coverage. Epson uses only the top model Ecotank ET-4550 pigment black. The three colors are based on Dye ink for the Epson Ecotanks and for the Canon Pixma-G printers. The Canon has a range of about 6,000 pages for a 135 ml bottle of pigment black. The combined ink range of the 70 ml bottles is 7,000 pages. This is slightly more than with Ecotank or Inkbenefit Plus. There is a video from India shows that they are cartridges with an integrated printhead, which are connected from above via valves with spikes to a hose system. In contrast to the firm, piezobased printheads of Brother and Epson, the heads must be inserted at the Canon itself and can be changed at any time. It is still unclear whether the printhead, which in this form has so far only been intended for one-way use, now counts as consumable material. Like the other Canon printers with FINE-Ink combination, the nozzles should be able to eject up to 2 picoliters of small drops. If the quality here is on a similar level as in the conventional Canon devices and about the Pixma MG3550 and one can hope for a more than decent photo quality. The common with Brother, the canons have the borderless printing in the formats A4, 10x15 and 13x18. Epson Ecotank printers available in Germany do not master all of these. Only in Eastern Europe are borderless six-color photoprints of the L800 series available. The printing speed at the Canon is expected to be leisurely and is with 8.8 ipm in black and only 5.0 ipm in color on the level of the simple Ecotank models. The print head of Brothers Inkbenefit devices is somewhat more powerful here. The equipment of the printer is quite rudimentary. In addition to the pure printing function, the models G2500 and G3500 offer an additional scanner with 600 dpi optical resolution. There is no dust-proof paper cassette or even a duplex unit. There is also no version with fax or document input (ADF) in the presented portfolio. The top model G3500 stands out only with its WLAN interface. This allows you to use the network as well as access from the Canon Apps for Android or iOS-compatible devices. The two smaller models can not do that.